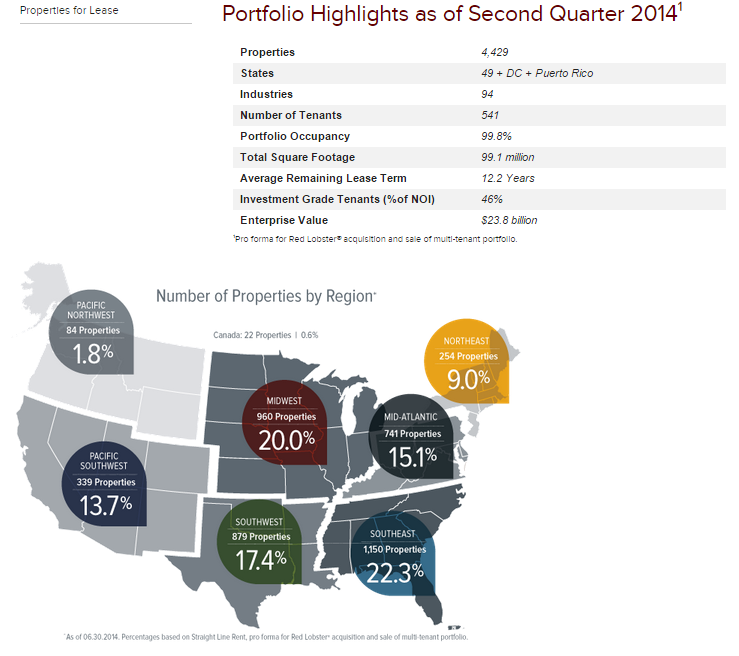 ATG Take on American Realty Capital Properties(ARCP)- Eat that Lobster! moMANon is pushing for an ATG position in American Capital Realty (ARCP), a large REIT focused on single tenant properties (including 500 Red Lobster locations) that has been at the forefront of scandal allegations over the past few weeks. Two weeks ago the stock started tanking on news that the FBI and SEC were investigating reports of accounting errors and potential fraud. The resulting drop in stock price has been dramatic- at one point the stock fell 37% to $7.85/ share from a price of $12.48/ share at the end of October before settling at $8.66 as of today. While nothing definitive has been announced, early indications are that the investigation centers around “improper accruals related to executive bonuses” as reported by none other than Ed Rendell, former Pennsylvania Governor and ARCP board member. At a minimum, it appears that some heads of ARCP management are likely to roll. I’ve looked at ARCP before, but never had a good feeling about Nicholas Schorsch and his basic strategy of simply gobbling up as much single tenant real estate as humanly possible to package into a diversified alternative real estate investment vehicle. As of a few months ago, the 10%+ dividend offered seemed thin compared with the 7% cap rates he was paying for recent acquisitions, and I was convinced that rates would start ramping up (which clearly did not happen). The Red Lobster lease-back transaction helped boost his yields, but I don’t exactly see people flocking to Red Lobster in droves (aside from those few seeking the nostalgic euphoria of Cheddar Bay Biscuits). The stock trades at a material discount to book value at 0.74. In today’s environment it is very difficult to find a REIT trading at a discount to book value, particularly one with a portfolio that is 99% leased with an average remaining lease term of 12 years. The REIT appears appropriately leveraged at approx. 55% loan to value with ample debt service cushion and an average interest rate of 3.55%. The current scandal might actually turn into a positive situation for shareholders, preventing management from aggressively pursuing further growth in a frothy real estate market. ARCP’s current forward dividend is 11.40%. The sustainability of this dividend is certainly questionable when looking at recent financials, but my rough back-of-the –envelope calculation for current cash flow yield is a very respectable 11% (Q2 2014 Earnings (with nominal sale activity) before depreciation/ amortization of $215 million, annualized against a current market cap of $7.81 billion). It appears that a substantial potential dividend drop despite ample cash flow support has been priced into the stock. At a very rough gut-check level, I agree that the market value of ARCP’s portfolio materially exceeds the current enterprise value of $17.7 Billion ($178 psf on 99 million sf). $178 psf feels pretty cheap for a well-diversified, strong credit and fully leased portfolio with an average remaining lease term exceeding 12 years. At the end of the day I think this is an opportunity to invest in a portfolio of stable, cash-flowing real estate assets that are worth more on the open market than the stock price suggests. Shady/ potentially unethical management has scared investors away in droves to the point where all it takes for this investment to succeed is some house cleaning at the front office and a new management team that can clip coupons and manage the debt side effectively. I’ll take that risk… and a double order of Cheddar Bay Biscuits!